Favn is the new product by Fritz Hansen and it has been presented on the Milan Furniture Fair this year. The sofa is the result of a creative dialogue between the Danish company and the Spanish designer and artist Jaime Hayón and stands in the tradition of famous Fritz Hansen classics like the Arne Jacobsen Egg Armchair and the Swan Armchair. ”Favn is a further development from Fritz Hansen’s design speaking and unifies Danish and Spanish elements”, says the designer Jaime Hayón. In the tradition from Arne Jacobsen he chose the shell-form as origin for his sofa, just as Jacobsen did in his time with his classics, the Egg Armchair and the Swan Armchair. Like a bowl, the Favn Sofa is hard and robust at its back and reveals a soft and inviting core inside. This characteristic of the design gave it its name. Favn is the Danish word for a friendly greeting or embrace and describes the thought behind the sofa on a plastic way: the user is invited to take a seat and feel comfortable. 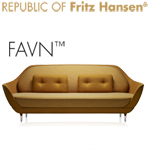 The Favn Sofa will be available from September 2011. Further information about Favn, the available variants and coatings as well as about Jaime Hayón are on the Fritz Hansen homepage.